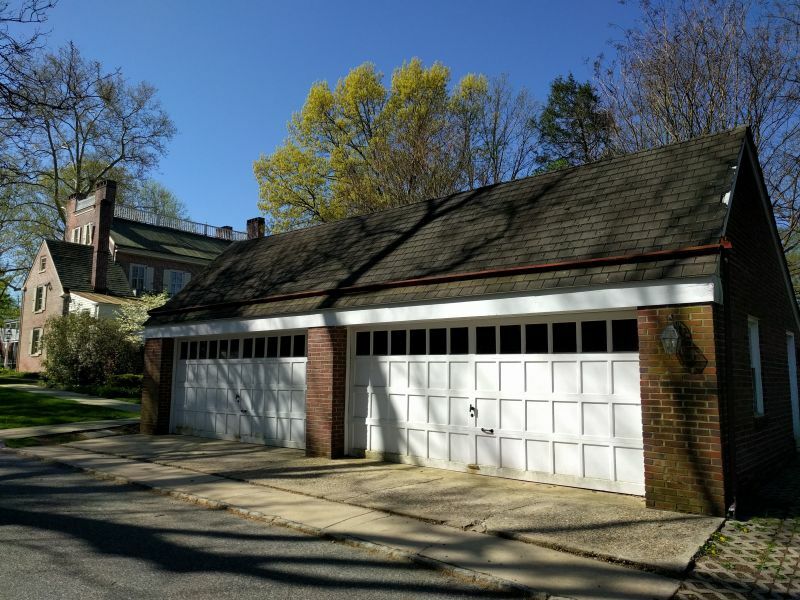 The Historical Society of Haddonfield has received a new $10,000 grant from the Haddonfield Foundation in support of its planned new archives center building. The Foundation awarded the grant in honor of past Historical Society president Pat Lennon, so it will be matched dollar-for-dollar through a challenge grant issued earlier this year by a donor who worked with Pat at the Historical Society and admires her greatly. With this grant and its match, the Society has now raised more than $858,000 in gifts and pledges for the new building. Donations can be mailed to the Historical Society, and gifts can also be made online. Donors who wish to have their gifts matched must designate that they are giving in Pat’s honor. The Society will begin construction on the new building this month. The planned facility will nearly triple the storage space for archival collections while incorporating up-to-date temperature and humidity controls and fire suppression system in an ADA-compliant building. Space in the new building will also be reserved for Haddon Township Historical Society archival collections, thanks to a generous gift earlier this year from the William G. Rohrer Charitable Foundation. A rendering of the planned new Archives Center reading room. The Historical Society of Haddonfield held a groundbreaking ceremony on August 1 for its new, state-of-the-art archives center building to be built on its property on Kings Highway East in Haddonfield. The Society has raised more than $817,000 in gifts and pledges for the new building and expects to begin construction later this month. 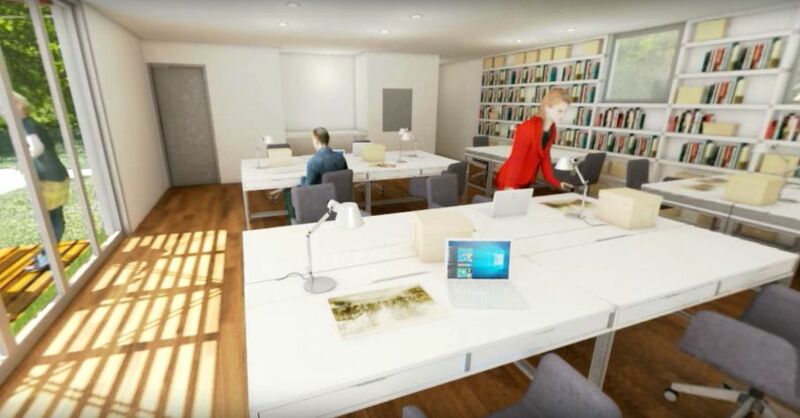 The planned facility will nearly triple the storage space for archival collections while incorporating up-to-date temperature and humidity controls and fire suppression system in an ADA-compliant building. 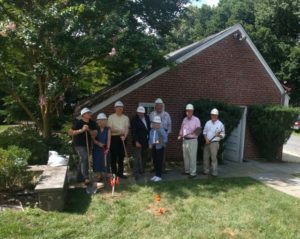 Space in the new building will also be reserved for Haddon Township Historical Society archival collections, thanks to a generous gift earlier this year from the William G. Rohrer Charitable Foundation. Other speakers at the groundbreaking ceremony included Haddonfield Mayor Neal Rochford and Haddonfield architect Eduardo Guzman, president of DCM Architecture and Engineering, who designed the planned new building. An ongoing challenge grant in honor of past Historical Society president Pat Lennon has brought in an additional $94,000 in gifts and pledges so far this summer. 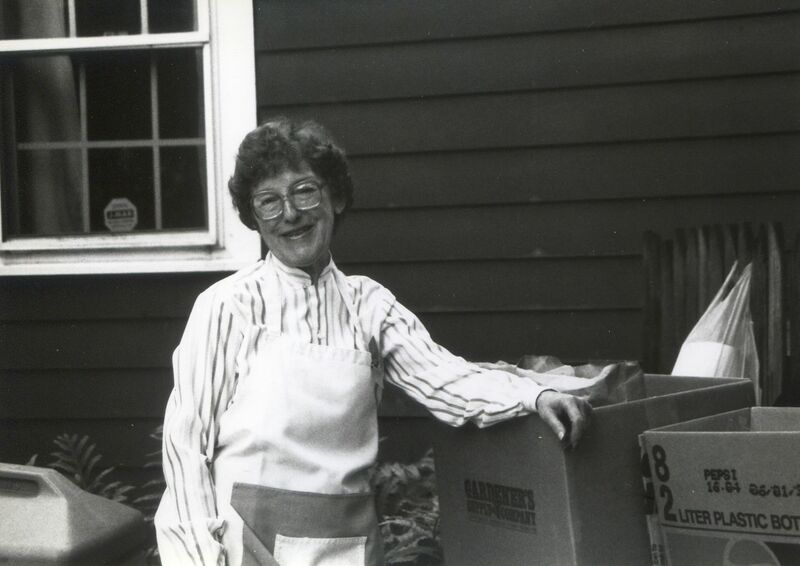 All gifts made in Pat’s honor are being matched dollar-for-dollar by a generous donor who worked with her at the Historical Society and admires her greatly. Donations can be mailed to the Historical Society, and gifts can also be made online. Donors who wish to have their gifts matched must designate that they are giving in Pat’s honor. Eduardo Guzman of DCM Architecture and Engineering and Historical Society of Haddonfield Board President Doug Rauschenberger speak to the crowd at the groundbreaking. Left to right: Eduardo Guzman, Carol Smith, Doug Rauschenberger, Mayor Neal Rochford, Tish Colombi, Bill Reynolds, Tim Alles, Bob Marshall. 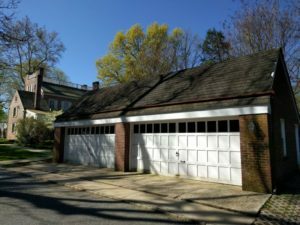 The Historical Society of Haddonfield has received a new $5,000 grant from the Rotary Club of Haddonfield Foundation in support of its planned new archives center building. 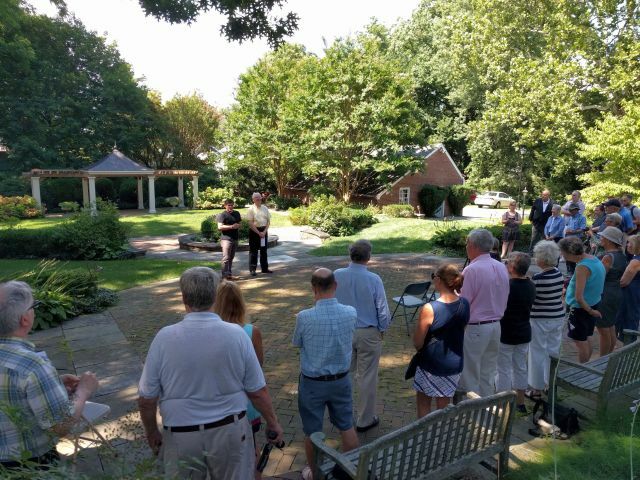 With this gift, the Historical Society has raised more than $722,000 for a new archival center to be built on its property on Kings Highway East in Haddonfield. A significant restricted endowment allows the Society to employ a professional archivist and covers other expenses of the archives center as well. The Society expects to break ground for the project this summer. The Historical Society also recently announced a challenge grant for the new building whereby all donations made in honor of past president Pat Lennon will be matched dollar-for-dollar by a donor who worked with Pat at the Historical Society and admires her greatly. The goal of the community challenge is to raise enough funds to reserve one of the new building’s naming opportunities in Pat’s honor. Donations can be mailed to the Historical Society, and gifts can also be made online here. Donors who wish to have their gifts matched must designate that they are giving in Pat’s honor. The Historical Society of Haddonfield has received a new challenge grant in support of its planned new Archives Center building: starting in May, all donations made in honor of past president Pat Lennon will be matched dollar-for-dollar by a donor who worked with Pat at the Historical Society and admires her greatly. The goal of the community challenge is to raise enough funds to reserve one of the new building’s naming opportunities in Pat’s honor. Now 96 years old, Pat was a long-time resident of Haddonfield before moving to New Hampshire to live with family. She is an active supporter of the Historical Society, and served as president for three separate terms in the 1970s, 1980s and 1990s. Pat was named Haddonfield Citizen of the Year in 1978, and has also been deeply involved with Symphony in C, Christ the King Catholic Church, and the Durand Academy, among others. 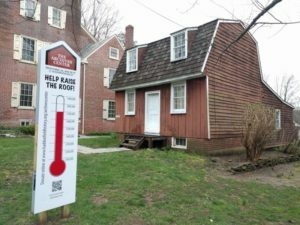 To date, the Historical Society has raised more than $712,000 for a new archival center to be built on its property on Kings Highway East in Haddonfield. The Society is now more than three-quarters of the way toward its fundraising goal of $900,000, and expects to break ground later this year. A separate restricted endowment already in place allows the Society to employ a professional archivist and covers other expenses of the archives center as well. Pat Lennon helps out at a Society event in 1992. The Historical Society is holding a garage sale on Saturday May 5 between 9 am and 1 pm. This truly is a GARAGE sale: we are emptying out the detached garage behind Greenfield Hall in anticipation of building our new Archives Center. The new building will replace the garage, so we need to clear it out. Plus many non-collection items from the closets of Greenfield Hall, including antique walking canes, eyeglasses, china and dishware, picture frames, and so much more!